The 2013 cheer season is upon us and shoes are a very important part of the uniform. Every season, new styles of cheer shoes arrive making the ever evolving cheerleading industry difficult to keep up with. Here is a list of the projected top 5 cheerleading shoes and their features for 2013. ﻿The Nfinity Evolution has been a top selling cheerleading shoe for many years and is, again, making its way into the top 5. The lightness and flexibility of this shoe is perfect for all-star cheerleaders and replicates the feeling of wearing nothing but socks on the spring floor. Weighing in at only 6.5 oz., the Nfinity Evolution has set the standard for competitive level cheerleading. The Ankle Loc Technology enhances the heel fit around the ankle and the leather and sateen upper provides support and breathability. The Nfinity Evolution is designed specifically to meet the needs of cheerleaders on a spring floor. ﻿﻿﻿﻿﻿﻿﻿﻿The Kaepa Touch is in the top selling cheer shoes because of the amazing support and comfort it has to offer. The new Touch Technology Kaepa used in this shoe is unlike any other. 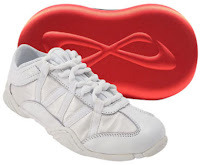 This shoe provides an immediate sensory connection between base and flyer and provides a stable platform for tumbling and stunting. ﻿Its hard to ignore the fact that the Kaepa Touch is designed with many supportive features such as a Torsional Outsole Bridge, structural sidewall bands, and the reinforced textured toe. 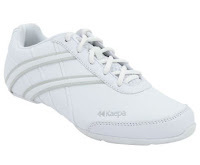 All of these features make the Kaepa Touch a top selling and extremely supportive shoe that is perfect for cheerleaders of all ages and all levels. 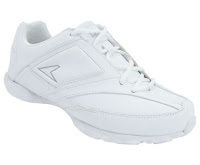 ﻿﻿﻿The Power Flash is a very lightweight and durable cheerleading shoe. But the value for your dollar is what really gets this shoe in the top 5 for 2013. Weighing only 6.5 oz., this is one of the lightest indoor and outdoor shoes available. The injection molded EVA/rubber midsole/outsole is what makes this shoe so lightweight and comfortable. But that is not all the Power Flash has to offer. The durability is spectacular and is extremely easy to clean. The lace locker and finger notch are also added features of the shoe. Priced with the consumer in mind, the Power Flash is one of the best shoes for your money. ﻿﻿The Kaepa Stellarlyte is one of the lightest and most durable competition cheer shoes available. Weighing only 6 oz., this shoe is designed to be worn on a spring floor or matted surface. Kaepa uses the finest ultralight materials to provide superior flexibility, comfort, and durability. True to Kaepa form, the Stellarlyte has a heel notch and patented Finger Grooves to help improve stunt control. In addition, the Waterproof Scotchguard coating keeps the mesh cleaner. 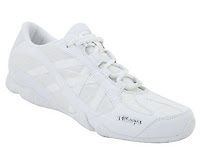 This very competitively priced cheer shoe will be perfect for your cheer gym and competition squad. ﻿The No Limit V-RO is a brand new shoe this year. The design of the shoe was inspired by Victor Rosario, the owner of 5 time World Champion, Top Gun All Stars. This shoe weighs only 4.5 oz. and is recommended for indoor use only. Available in May 2013, this extremely light shoe will make you feel like you don't even have them on. The lace protector helps keep the shoes tied and the shoe has an insert to help prevent ankle rolling. Cheer and Pom offers very competitive team pricing on footwear and we have Team Sales Specialists to help you every step of the way. Contact us today and we will provide you with all your footwear needs.